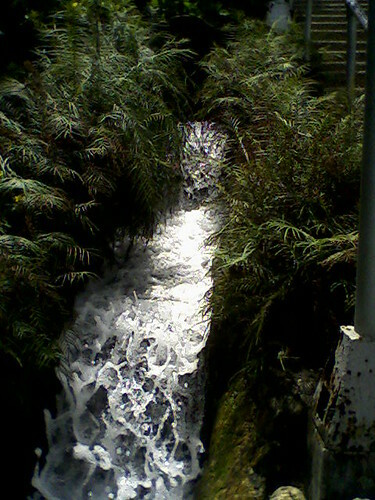 Badiang Spring is an underground freshwater spring that gushes forth over a cliff only a few meters high forming an attractive waterfall. The water is icy cold and flows directly to the sea which is only a few steps away. The area where the spring is located is scenic. The top of the cliff is full of trees and from there you look towards the mesmerizing blue expanse of the sea. Under and on the sides are rugged cliffs with intermittent tall coconut palm trees, old talisay trees, and other tropical foliage. The area is a favorite haunt of the locals, who either bathe under the falls or go swimming in the crystal clear water of the sea beyond. It is also a source of drinking water of the surrounding neighborhood. Likewise, the water that flows to the sea is where the locals wash their soiled clothes. The beach is not of fine sand. It is a beach of round and smooth stones – a joy for pebble collectors. The crystal clear blue sea beyond is ok for swimming and for snorkeling. The water is icy cool near the spring’s outlet and warmer further off. Nowadays, the area where the spring is located looks different: more attractive and convenient to bathers. Gone were the days when I bathe in the spring under its natural surroundings . . . and for free! Before, only a small pathway leads down a rugged cliff towards the spring’s natural outlet. Coming out from the top side of a cliff, the rushing water flows naturally over it, forming a waterfall. The water then winds its way thru a stony ground towards the sea. Now, due to the ever increasing influx of tourists, local and foreign alike, the LGU (Local Government Unit) and the eco-tourism council of the town where it is located developed the area into a tourist haven. 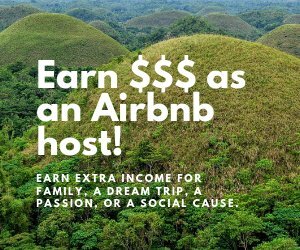 With an entrance of P20 per adult and rental fee of cottages, huts and shelters, the municipality earns and is able to give jobs to some of their constituents. With the resort as an initial project, the government is aiming to develop more income-generating ventures and turn the sleepy town into a tourist destination. 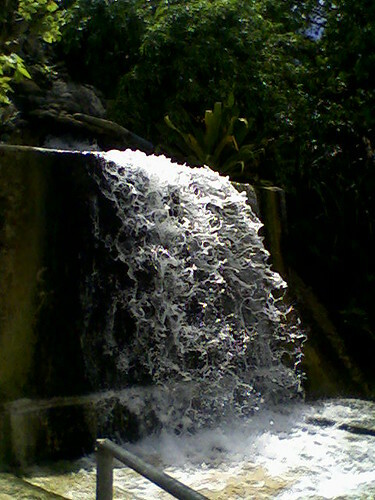 The Badiang Spring is located along the coast of Valencia town, at barrio Anas, in the province of Bohol. This is one province of the Philippine archipelago that has developed into a tourist destination. Valencia town is 42 kilometers away from Tagbilaran City, the lone city of the province and its capital. It lies east along the coastal highway. The town is a 4th class municipality with a population of over 7,000 spread into 35 barangays. 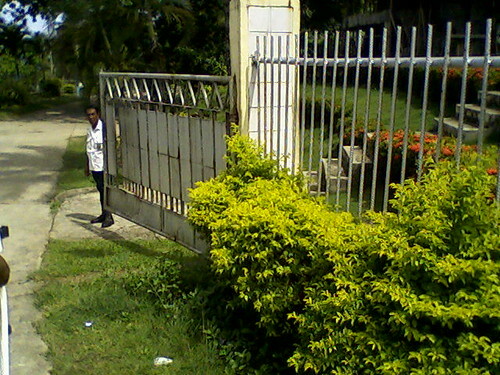 The Badiang Spring Resort is relatively small and fenced in. At the top level and thru openings in between trees and dense foliage, one sees the blue sea beyond. Wide cement steps provided with metal handrails lead down a cliff towards two (2) swimming pools: one big and the other designed for children. 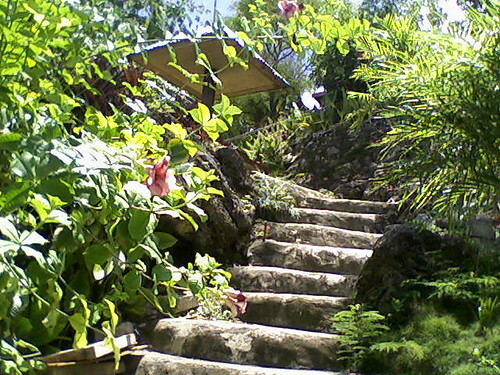 As you go down the steps, the waterfall is at your left-hand side. The water gush forth from two pipes and the side of the falls, instead of a rugged cliff, has been landscaped. It is now easier to rest on the wall and allow the cool rushing water to engulf oneself. Below the waterfall is the kiddie pool which lies alongside a covered yet open-sided pavilion. The pavilion is equipped with long tables and a few benches. The bigger pool is situated at the right-hand side, rectangular in shape with the deepest part at 8 feet and the shallower portion at 5 feet. The big pool is fed by the spring thru a concrete channel which is controlled by a valve. Excess water from this pool flows down and fills up the smaller pool. The underground spring water, though often diverted to fill up the pools, flow out incessantly out towards the sea. Some water is diverted at the far side of the waterfall for the locals to bathe and wash their clothes in. This is outside the fenced area though. Thatched huts provided with tables and concrete seats are near the big pool. Some are located on the concrete veranda along the seashore. Dressing and comfort rooms are likewise available. The area is well lighted with decorative lampposts so guests can enjoy swimming in the pool even at night. 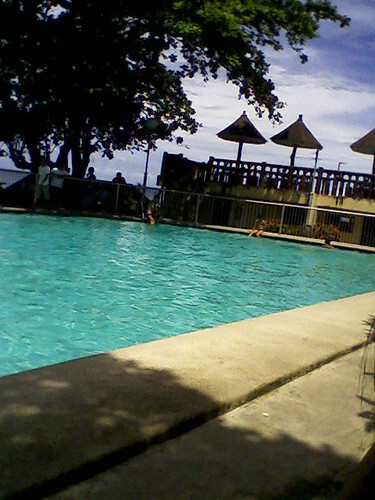 This is the only resort in Bohol where guests can enjoy both the cool spring water and the warm waters of the sea below. Warm sea water can be had a bit far off from the spring’s outlet to the sea. 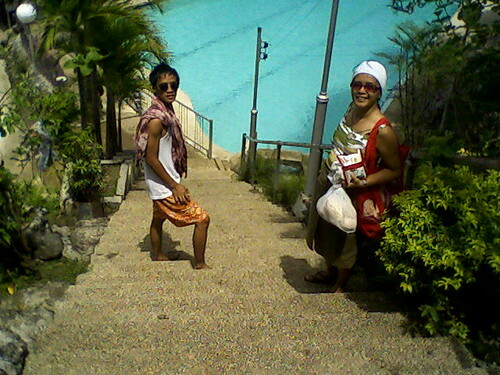 It is by far the cleanest public resort in the province and the most accessible. Rides are available from the Dao Terminal at Tagbilaran City. You can choose either v-hires or buses to take you to Valencia. Just tell the driver to drop you off at Badiang Spring and they will gladly do so. 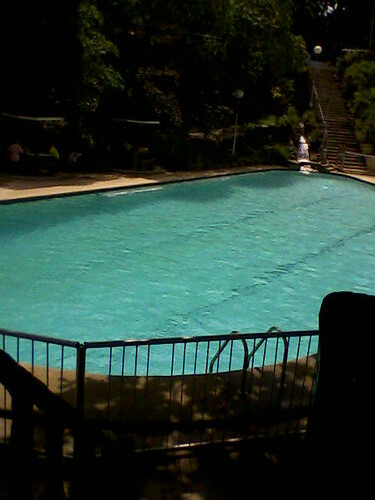 The Badiang Spring Resort is only a few steps away from the National highway.